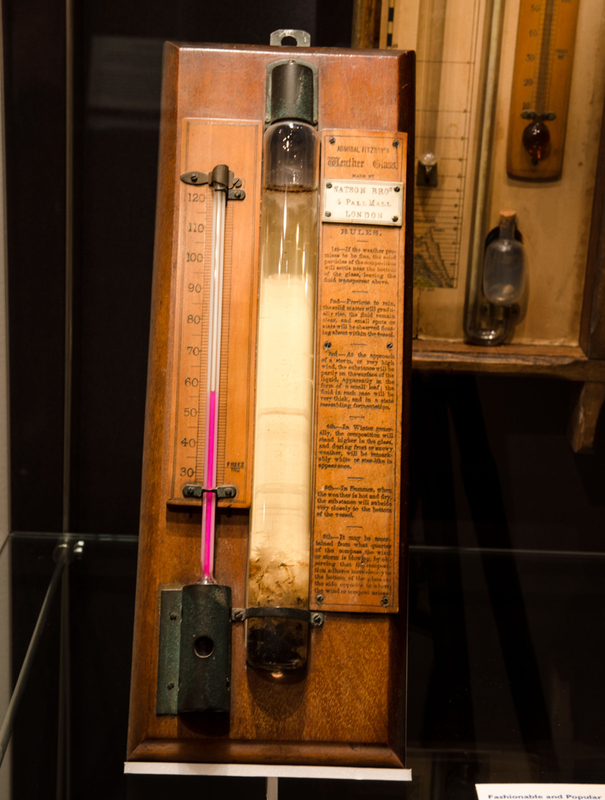 Ever since the thermometer and barometer were devised in the 17th century, measurements of temperature and air pressure have been central to meteorology. For much of their history, mercury was the preferred material used in both instruments. It is the only metal which is liquid at room temperature and standard atmospheric conditions, and it expands relatively uniformly in response to heat. This makes mercury an ideal substance for a thermometer because its changes in volume inside a glass tube can be read – on a graduated scale – as changes in temperature. Mercury was favoured for barometers because of its high density. The instrument acts like a pair of scales, with the column of mercury counter-balanced by the pressure of the total column of air above it. While the mercury in a barometer typically stands about 0.76m high, an equivalent water barometer needs to be much larger. The lower density of water requires a tube more than 10m tall. 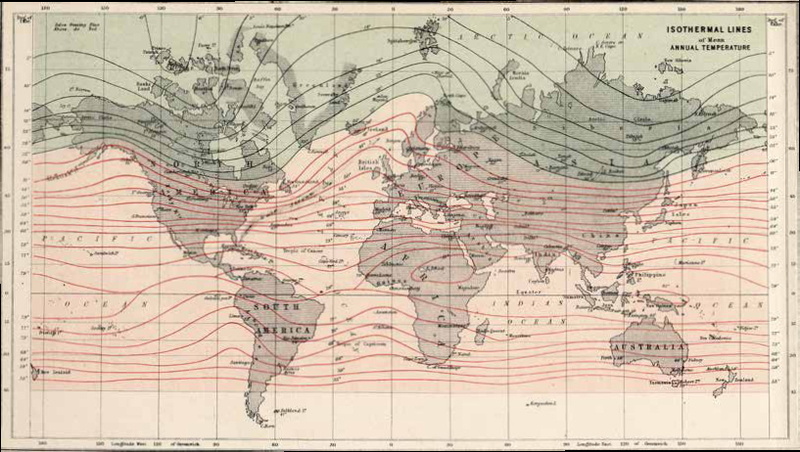 A late 19th-century plot of mean temperature lines from a Physical Atlas. The use of colour very clearly reveals the effect of the Gulf Stream in providing a north-easterly finger of warmer air over Britain and Scandinavia. This barometer is specifically for surveying. Made by John Davis & Son in Derby in the early 20th century, it is an aneroid barometer: it does not use mercury but an evacuated capsule which responds to atmospheric pressure and moves a needle. The barometer was developed for many particular circumstances and uses. 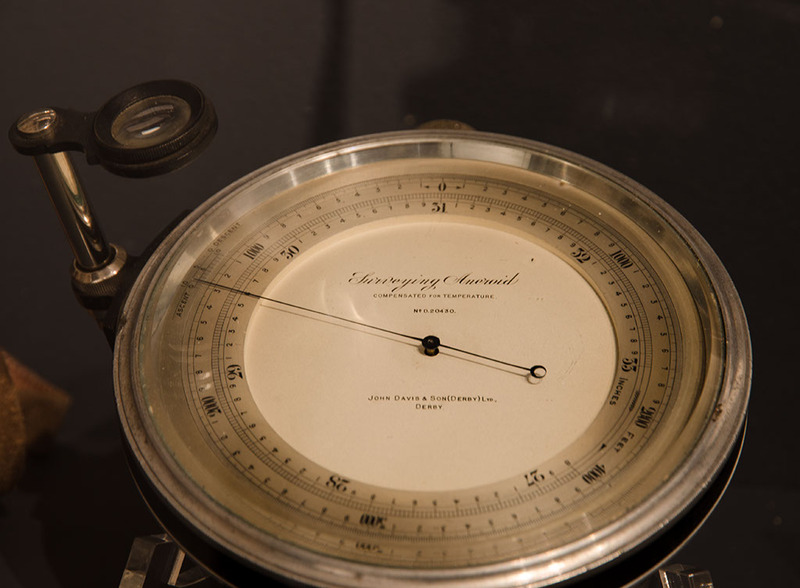 Standard mercury barometers could rarely survive the rigours of use at sea. The motion of the ship would make the heavy mercury pulse up and down, and the shock on the glass would break the tube. As a solution, Alexander Adie created the sympiesometer. Patented in 1818 and marketed as a marine barometer, it has a J-shaped tube with slow-moving oil at the lower end. Although not as accurate as a mercury instrument it was popular on ships and thousands were sold throughout the 19th century. Since a barometer measures the weight of the column of air above it, it was quickly realised that a barometer could also indicate altitude, as the weight of air reduces with height. Thermometers were often made not just to display the current temperature but to mark extreme events in the past. An earlier example in the exhibition, from the mid-18th century by P. Wast of Amsterdam, records the particularly low temperatures experienced at St Petersburg. A small French 19th-century example by Doninelli Fils of Nice gives maximum and minimum temperatures for Paris of 105° F / 40° C in 1802 and 10° F / -12° C in 1845. The weather glass above was an adaptation of the popular storm glass, and Admiral Fitzroy’s willingness to consider its merits went beyond the views of a number of his scientific peers. By the 18th century the barometer could be considered in Britain “both in Regard of Curiosity and Utility … [as] the first in Dignity among the modern Philosophical Inventions”. The leading scientific instrument makers supplied the devices which had quickly shifted from experimental novelties to luxury consumer items. Thomas Heath was one of the most noted makers of precise mathematical instruments in early 18th-century London. A barometer with spirit thermometer, signed by Heath, shows that he followed fashion in the marketplace. A different audience is implied by two other instruments in the exhibition. Both carry the name of Robert Fitzroy (see right), Darwin’s captain on the voyage of the Beagle. As Admiral Fitzroy he became in 1854 the first head of a small Meteorological Department that was the origin of the modern Met Office. Fitzroy was responsible for many initiatives, such as the distribution of standard instruments, the telegraphic reporting of daily weather and a storm warning system. His interpretations of the barometer reached a wide public and became almost a brand name on barometers. Some members of the Royal Society remained anxious about the propriety of forecasting in meteorology, a science whose reliability still seemed to them remote from the well-established doctrines of astronomy, for example.